The new CCIH Close Up series connects you to CCIH members. 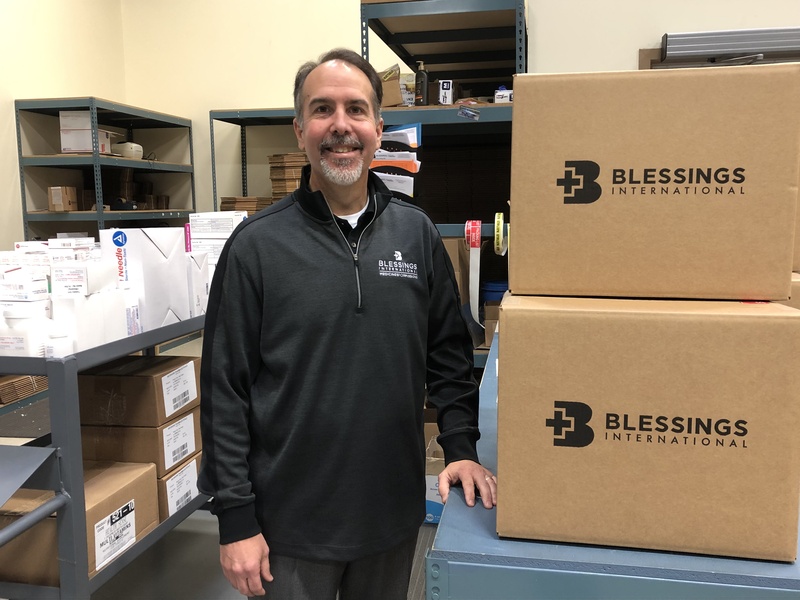 This month we talked to Barry Ewy, CEO of Blessings International, located in Broken Arrow, Oklahoma, U.S.A. about how he integrates his faith with his work, a church service that changed his career and led him to where he is today, and what he would like to see in Christian global health work. What does Blessings International do? Blessings International provides medicines, vitamins, and medical supplies to short-term medical teams that travel throughout the world, as well as permanent hospitals and clinics in developing nations. We equip organizations serving in disaster relief and those serving people in need within the United States. We also provide a medication repackaging service where 13 different items can be packaged into 22 different languages. Our goal is to serve those who are caring for the most vulnerable patients worldwide and ensuring the team or in-country facility receives quality supplies with long expiration dates. A typical day at Blessings International is receiving requests from our various partners and working to fulfill those orders. If it is a Tuesday or Thursday, our day begins with a chapel service where we worship and pray together for each other and our partners working worldwide. For me personally, a day can involve working through regulatory matters, working with my leadership team to develop new or unique programs, and working to serve in various areas of the organization where help may be needed. I also work a lot with our partner organizations that are shipping directly to the country where the medicine and vitamins will be used in a clinic or hospital setting. Was there a turning point in your life that shaped your direction and led you to where you are now? The turning point that led me from working in the for-profit world to transition to a non-profit organization took place a little over five years ago. It began one Sunday morning when my church had two crosses set up at the front of the sanctuary, one on each side. Each of the attendees that morning were given a card and asked to write how they would be willing to serve and then place the card at the foot of the cross and speak into the microphone by the cross: “Here I am Lord, send me.” It was immediately placed on my heart and I wrote on my card: Ministry and Medical Missions. At that time, I didn’t know exactly what either meant for me, but I was committed to following through with what the Lord had in store. Five years later, the Lord opened the door for me to come to Blessings International and use my education in law, pharmacy, and health administration along with my experience to lead the organization. What is the most satisfying part of your job? The most satisfying part of my job is knowing that we are serving the Lord through the distribution of quality medicines, vitamins, and medical supplies to each partner that we serve. We are thankful to track the estimated lives touched based on what we send out and it is extremely satisfying knowing that each and every number is potential impact for the Kingdom. How do you integrate your faith with your job? I am able to integrate my faith with my job through having an organization-wide chapel twice each week where we have a devotion and we worship and pray together. I also integrate my faith by making sure that all of our staff recognizes our jobs are to serve the Lord. The service begins with my serving my direct reports any way that I am able and expecting them to serve their direct reports in return. Where do you think Christians working in global health should be focusing right now? As Christians continue to make an impact in advocating and bringing health equity to all nations, one area that should be reinforced is policies and procedures when sourcing medicines for developing nations. We are a firm believer that to whom much is given, much is expected, and our witness is reflected in the quality of care and the medicines we provide for the most vulnerable patients. Part of quality procedures involves ensuring that each permanent and short-term mission provides medicines with long expiration dates and products that were manufactured through Good Manufacturing Practices and the highest regulatory oversight. What is missing in Christian global health right now? I feel that Christians working in global health should not be apologetic for desiring to both serve others and serve Christ. In many areas there is a push or desire to focus solely on the humanitarian work being performed while leaving the Gospel out of the work. I feel that it is important for those that are being served to know that Jesus loves them and that is why we as followers of Jesus are there. I would love to see more organizations continue to work together to create a long-term sustainable change in a communities’ health care rather than a one-off visit that doesn’t result in lasting change. Part of that long-term sustainable change would hopefully include training local personnel so that they are able to provide health care to others in their community and improve their economic status. Is there a book or workshop that inspired you and that you recommend to colleagues? I would highly recommend the book The Servant by James C. Hunter. It is an excellent book on leadership that provides a paradigm change from the top-down mentality of organizational control to a bottom-up (with the CEO at the bottom and the customer at the top) mentality of serving others.